I had several recipes planned to try over the past few days, but life being what it is…well, that didn’t happen. I had to sustain myself on leftovers and PB&J. Not that I’m complaining, since those leftovers were pretty dang good! But I had some extra time today, and decided to actually make a full dinner dish. And then, when I finished my thesis chapter several hours ahead of schedule this afternoon, I figured I should celebrate by making a side dish. Thus was the Sunday dinner born (a rarity for me – I’m usually too busy to cook a full meal on Sunday nights!). My decision to make the vegan Lemon-Garlic alfredo stemmed from two separate recipes: this one from the Minimalist Baker, and a similar recipe from Food Network. The latter recipe was easier to make, so I just borrowed the roasted asparagus idea from the Minimalist Baker 🙂 I’ve never had cooked asparagus, and I thought it would be fun! Since they take about 30 minutes to roast, I got them in the oven first. 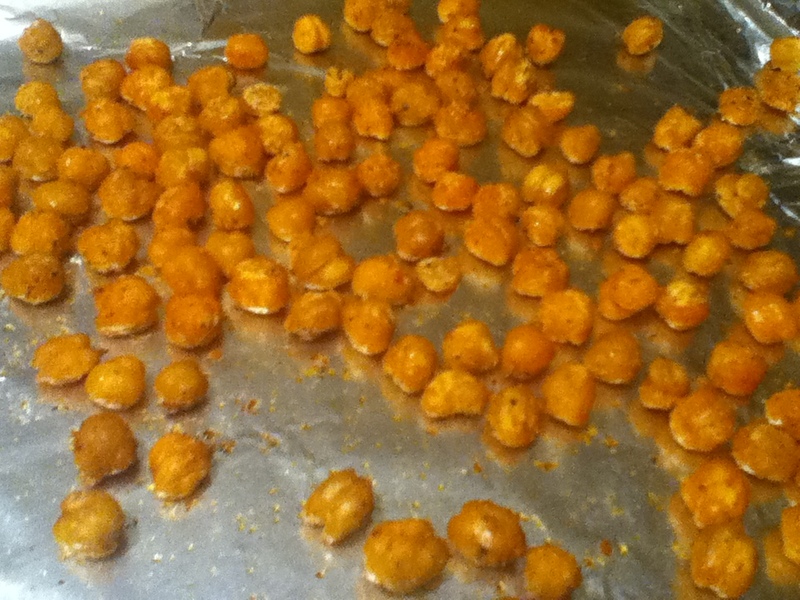 While they were cooking, I began on my side-dish: Oven-Roasted Chickpeas. 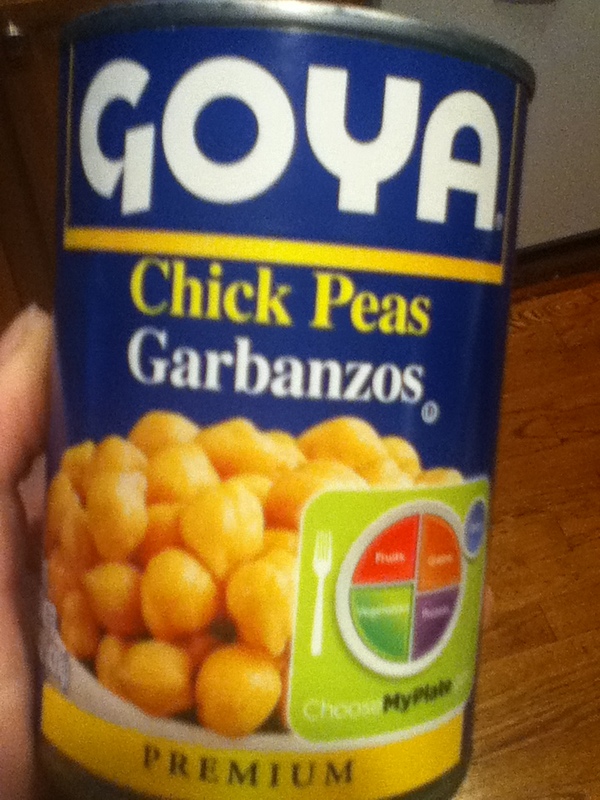 I picked up a can of chickpeas at the grocery store on a whim, and figured this was the best way to try them out, as I’ve only ever had chickpeas in hummus. 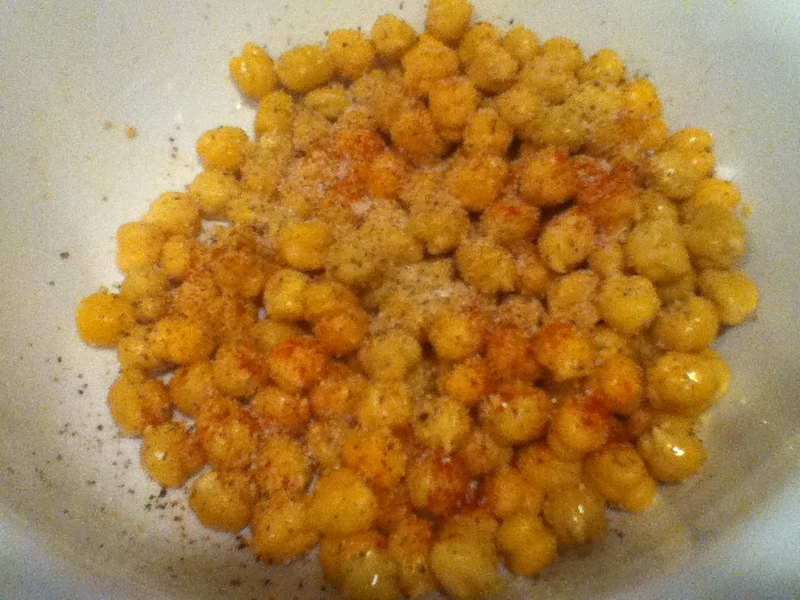 After the chickpeas were dry, I coated them with the coconut oil and added the spices. 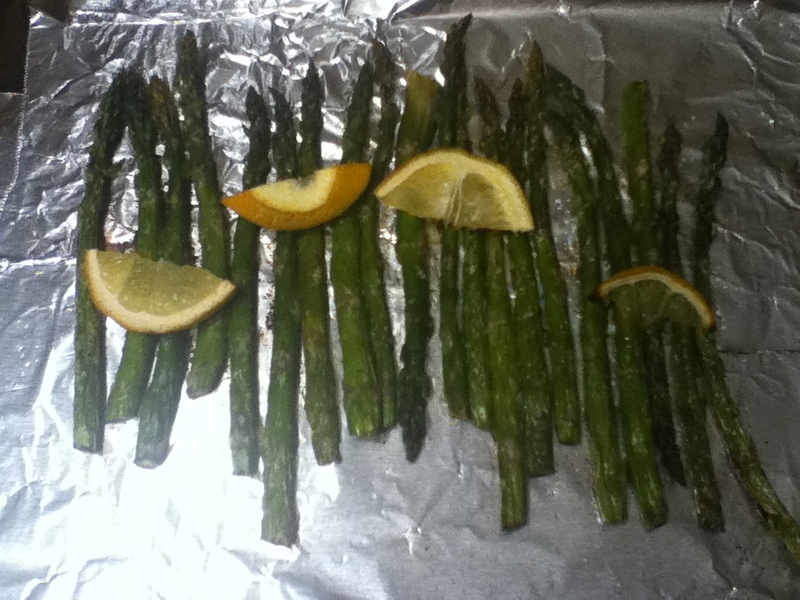 Once they were on the pan, I set them aside while my asparagus was cooking. 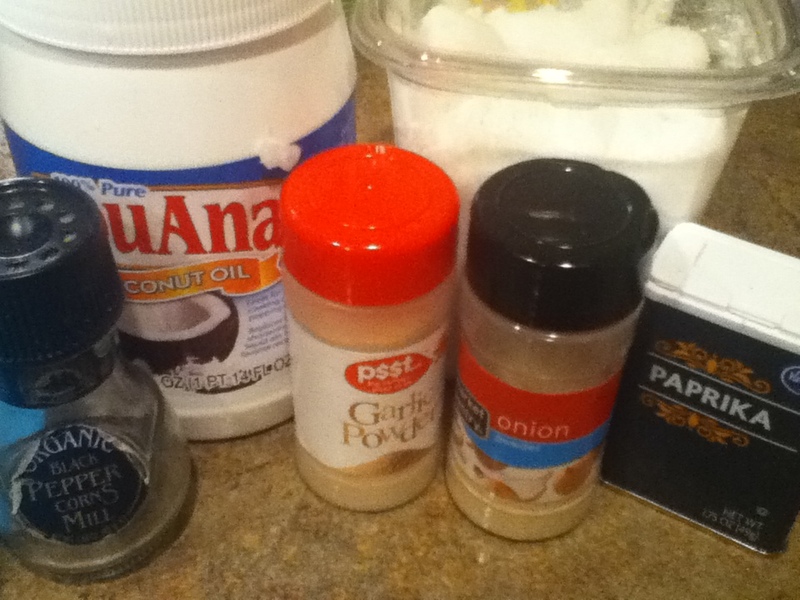 It was time to get the rest of the dinner ingredients together. I got the water boiling for the pasta, sprinkling it liberally with sea salt. Do not neglect to salt your pasta water!!! Cooking in salty water gives the pasta flavor on its own. 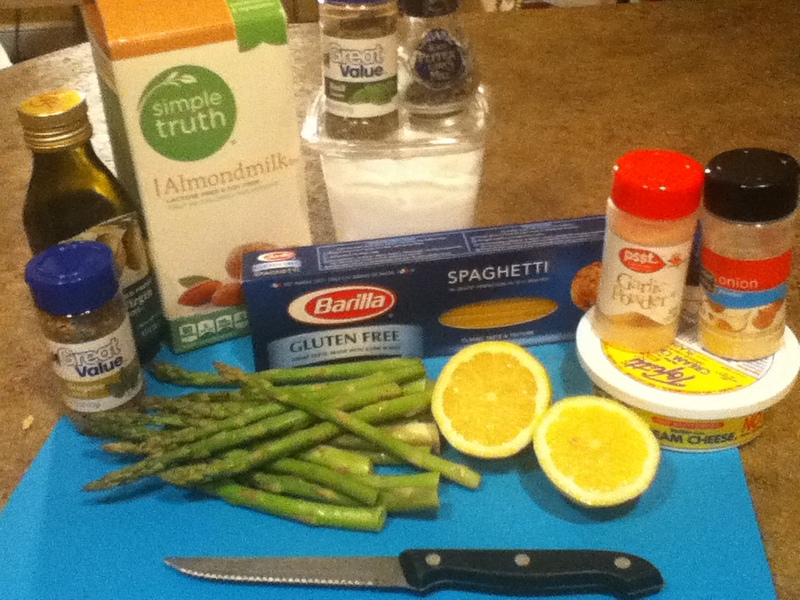 Anyway, I used my favorite brand of gluten-free spaghetti, as that’s what I had on hand. By the time the asparagus came out of the oven, the pasta was cooking, and the sauce was blended and ready to go, and into the oven went the chickpeas. 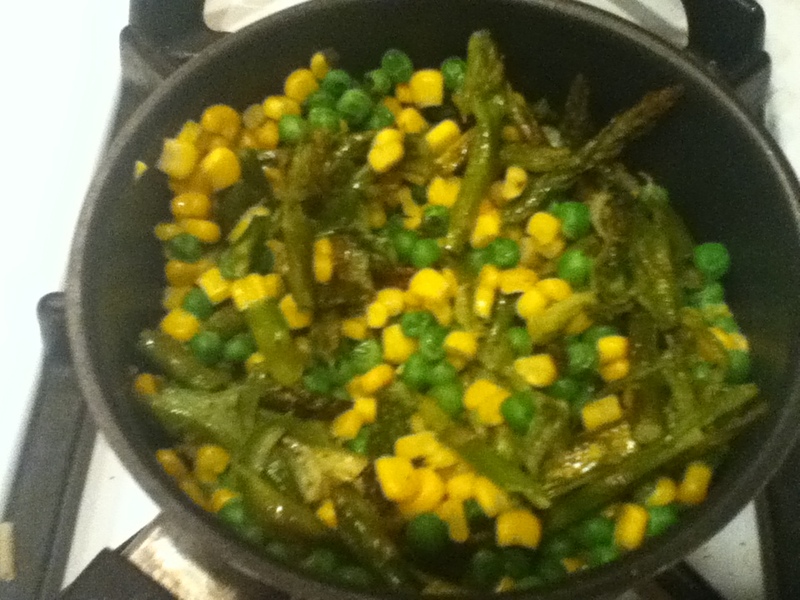 At the same time, I put some corn and peas on the stove to warm up, along with my chopped up asparagus. When the pasta was done, I mixed about a quarter cup of the pasta water into my sauce, and cooked it up on the stove with some garlic, oregano, and basil. 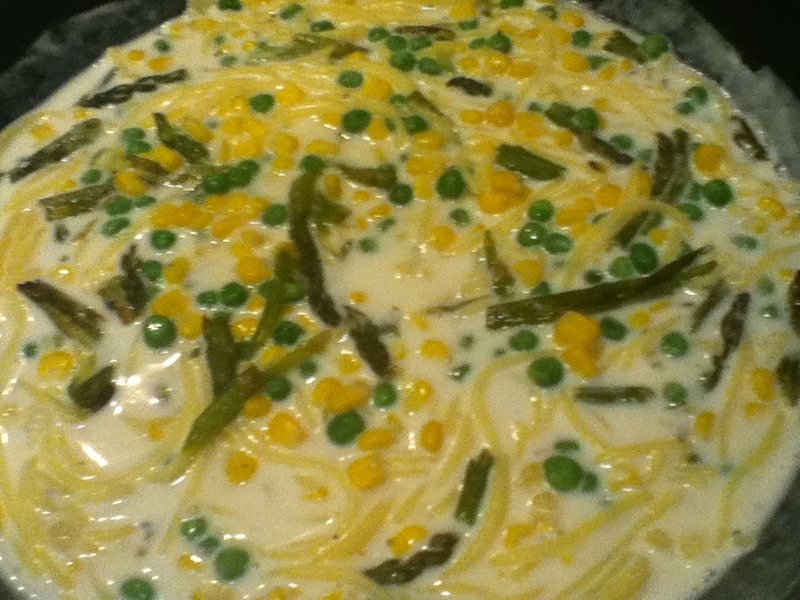 When it was warm and thickened, I turned the heat off, and added the pasta. Isn’t it gorgeous?! All those beautiful, natural colors. The chickpeas were finished roasting about the same time the pasta finished, which was a timing miracle. They filled my kitchen with a wonderful spicy aroma. It was difficult to not eat them all right then and there! To go with my meal, I toasted up some vegan multigrain bread and spread it with some vegan garlic butter. Then, because I didn’t want to drink plain old water with such a fun meal, I took a slice of the lemon I zested for my sauce, and added it to my glass of water. Voila! A perfect Sunday dinner. Unfortunately, I discovered that I don’t like cooked asparagus – the texture is too much like green beans, which I have always hated. Everything else was insanely tasty, though 🙂 It was a good way to round off my first full week of being a vegan. I feel healthier, am more conscious about what I eat, and have lost about three pounds. It’s been a good journey so far! 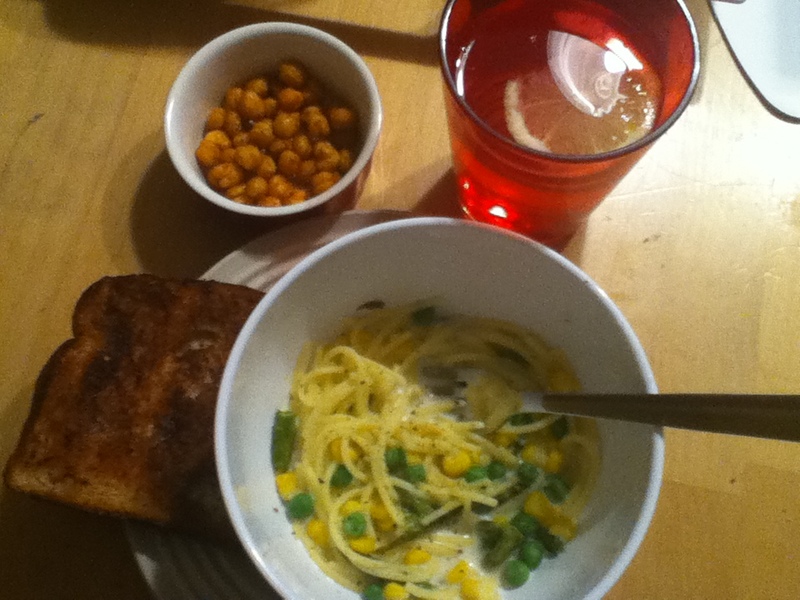 This entry was posted in Dinner, Gluten-free, vegan and tagged chickpeas, corn, dinner, pasta, peas, recipes, vegan, veggies. Bookmark the permalink.